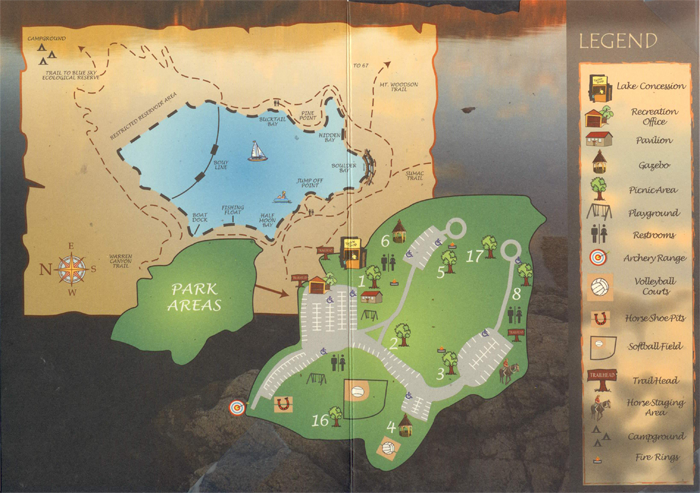 Length of Trail: The trail around Poway Lake is about 3 miles. You can extend the trail by taking the trail on the Northwest corner of Lake Poway to Blue Sky Ecological Reserve. 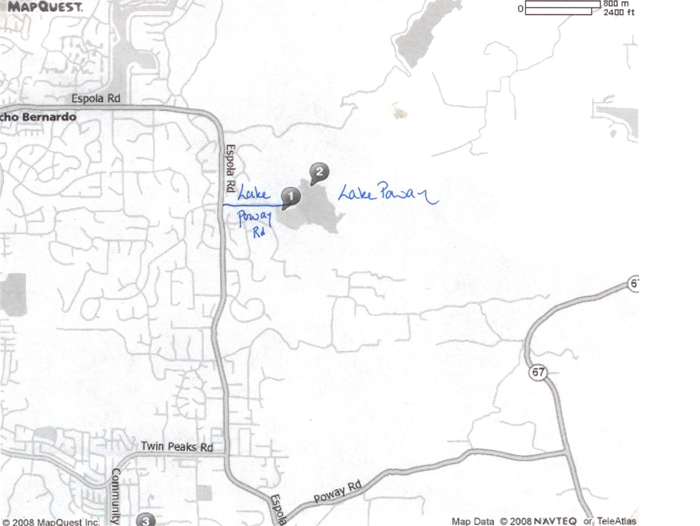 Staging Area: Lake Poway is located at the east end of Lake Poway Road, which is off Espinola Road in Poway. You reach Espinola Road from Poway Road, which can be accessed from Highway 15 and Highway 67. The lake lies in the coastal foothills, just four miles east of Highway 15, five miles south of the City of Escondido and southeast of Rancho Bernardo. There is a well marked staging area for horses with parking for several trucks and trailers. You may have to pay a few dollars to park there in some months. There is water for horses and restrooms. There are also nice picnic tables nearby. Water: Although the trail circles Poway Lake, there is no access to water for horses on the trail. Trail Conditions: Easy to moderate. The trail is wide and well maintained. There are several hills. General Trail Info: The trail starts by the staging area. The trail is well marked. It goes all the way around the lake and is about 3.2 miles long. There is excellent footing for horses and some magnificent views of the lake and surrounding mountains. At the dam end, the trail descends about 100 feet down to the bottom of the dam. At the low spot there is another trail/gravel path that continues further down the hill in the Blue Sky Reserve. There are also signs on the trail directing you to the Mount Woodson trail. After the turnoff into the reserve, the Lake Poway trail turns uphill and makes a series of fairly steep switchbacks back up to the lake, and you can end the trail at the parking lot.